Now all the World and official tournament adopt the WPA rules. Francisco Bustamante is the Champion! 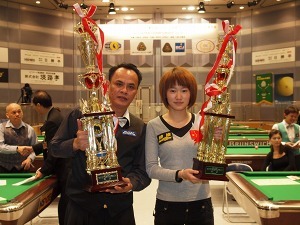 China’s Han Yu is the champion in the women’s division. Arrival Airport: “AUGUSTO CESAR SANDINO” Managua, Nicaragua. Sorry, members: the event will be rescheduled, the final desicion will be announced soon after we received from The organizer: Dragon Promotion. Welcome to Asian Pocket Billiard Union.